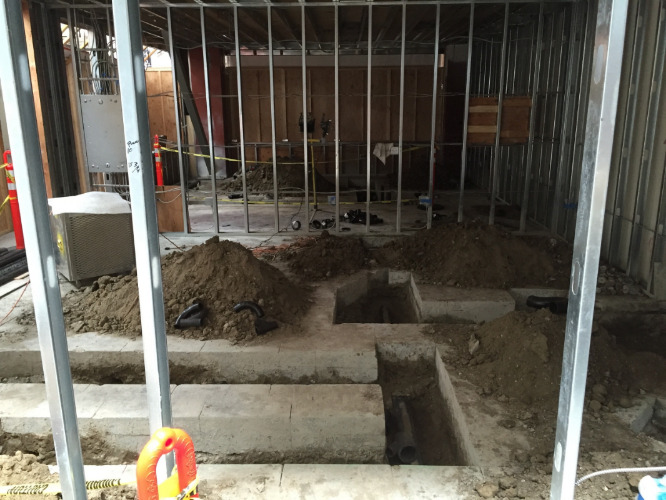 Bay Area Restaurant Construction; or, Farewell to Money! As a small business owner, there’s nothing I love more than writing checks. Especially big ones. The bigger the better, I always say. And guess what? I’m getting a world-class opportunity to write a lot of big checks. I’m doing commercial construction in the Bay Area. As they say, let the good times roll. I’ll level with you. I didn’t have a good sense of the costs of construction going into this project. I knew that building out a restaurant is an expensive proposition, but not much more than that. I was reassured that we were only building a small sub-400 sf kiosk. How much could that cost, really? No dining room, bathrooms, storage space, exterior, etc. When I was taking bids from architects, a lot of them speculated that this kind of project should cost somewhere between $60-100K. One guy suggested it could cost $150K. We thought he was an outlier. It turns out he was the only guy who even remotely knew what he was talking about. And he underestimated, too! Emeryville Public Market. There's the future Shiba Ramen right there in the middle. The space seems modest, but the price tag isn't. The first step to building is to get bids from general contractors. If you haven’t done this before, it’s likely to be a much more involved and protracted process than you might expect. For us, this wasn’t entirely surprising. We’ve hired contractors to work on our house, and are endlessly surprised by how unresponsive a lot of them are, especially for being in a client service business. When you hire a GC, this phenomenon is magnified, because the GC has to collect bids from a whole range of subcontractors before it can give you a bid. And there are usually multiple rounds of bid revisions, as you work with the GC and the other stakeholders to clarify the project scope and all the fine details. How easy it is to find a sufficient number of willing bidders (at least 3 seems to be conventional wisdom) depends on where you are. The Bay Area is in the midst of a building boom, making it more challenging to find a GC with the time and interest in a relatively small project like ours. We are just starting to build our commercial construction network, so we asked our various designers and our landlord for recommendations. The landlord recommended its GC, who is already on-site doing the food hall renovation. The designers added five more recommendations. Out of that set, two GCs told me that they didn’t have time for this project. One promised a bid, but despite numerous follow-ups on my part, never delivered. I ended up getting three bids: one from the landlord’s GC, one from a GC that specializes in restaurants, and one start-up design shop looking to expand into larger projects. Building Boom. November 2013 San Francisco Magazine described dozens of new high rise projects (left). Recent view from the temporary Transbay Terminal (right). When the first bid came in, I about fell out of my chair. Around $190K. Out went a flurry of emails. “This is a non-starter!” “This is insane!” (Spoiler alert: this is the GC we hired.) But the next bid came in at around $240K, adding a some perspective. I met with each of the GCs in person to walk through their bids. I spent some time issue spotting in the bid documents—figuring out where they’d gone too far, where they hadn’t gone far enough, and highlighting the differences across bids. The main issue was to get the scope right, so that the bids are as accurate as possible, and you're comparing apples to apples when you decide. Each of the GCs made different assumptions about what was in our scope, what was in the landlord’s scope, and what was in the scope of our kitchen equipment supplier. It took a few weeks to get everything straightened out. But, I am pleased to add, the costs came down. That said, there wasn’t much (i.e., any) room for negotiation. In this crazy building environment, plumbers and electricians aren’t exactly trying to compete on price. And what we ended up seeing was that the big ticket items—plumbing, electrical, HVAC—were remarkably similar across all the bids. So there were few obvious pressure points for pushback. The market is what the market is. In fact, even the GC was surprised by how high its own bid was; that they'd expected their subcontractors to come in much lower. According to our designer, certain construction labor costs in the Bay Area have gone up 20% in the last year! This Week in Shiba Ramen! Plumbing is serious and in full swing. Apparently a subcontractor cut those trenches at 3:00 a.m. with a 30-inch saw blade. The landlord’s GC, sf-based CCI, ended up being significantly lower in cost because it was already there on-site, really cutting down on overhead that we'd otherwise have to pay for. That, plus their familiarity with the building and their relationship with the landlord’s personnel, made it an easy choice to hire them. In an environment where there are so many stakeholders, keeping the number of variables to a minimum is important. We’ll take some cover where we can get it. We did end up hiring the design shop, also SF-based LMNOP Design, to do a limited scope of specialty work: the wood soffit above our counter is a key design element, and we wanted sufficient attention to detail in the fabrication process. They’re also doing our signage and menu boards. These guys seem to have a good sense of aesthetics and craftsmanship, and I'm excited to see their work. In the end, it’s going to run close to $190K for the construction plus all the signage and fabrication work, not including architecture or any equipment. This seemed somehow unimaginable three months ago. But after successive stages of outrage, shock, bitter laughter, we've arrived at a state of mild amusement. At some point, things just stop shocking you, and you just deal with it. Construction started two weeks ago. Each night before bed, I say a prayer for no change orders! More updates soon.